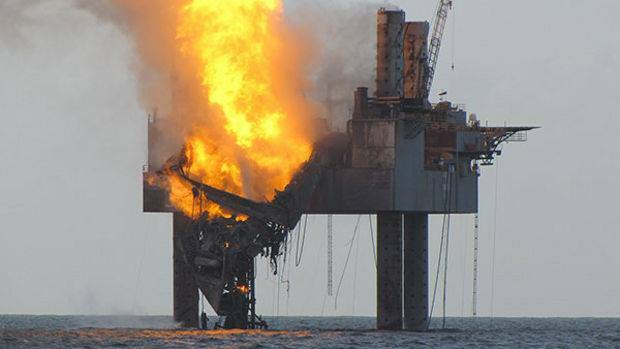 Hercules Drill Rig Engulfed in Flames – Now What? UPDATED 7/24/2013 3:10pm EDT with new photo, info on drilling permit. 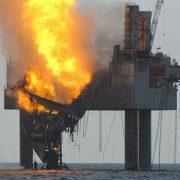 At about 11pm Central time last night, the Hercules 265 jackup drill rig in the Gulf ignited. It’s now engulfed in flames. Options for controlling the gas blowout are now a lot more limited, since the rig can’t be occupied by well-control specialists. Eventually the well might collapse on itself, “bridging over” and shutting off the flow of natural gas. Otherwise a long and complicated intervention might be required, such as the drilling of a relief well — the solution required to kill BP’s runaway Macondo well in 2010, Chevron’s fatal blowout off Nigeria in 2012, and the months-long blowout and massive oil spill off Australia at the Montara platform in 2009. Either way, the rig is certainly a total loss. Hercules 265 jackup drill rig on fire, July 24, 2013. Photo from US Coast Guard via the Times-Picayune. We saw nothing unusual at the site on yesterday’s MODIS satellite images, which were taken in early afternoon, long before the fire began. Today’s images might be more interesting, although we’re not expecting to see any significant slick on the water. Luckily, this well was apparently just a gas producer. Otherwise the situation could be gravely worse, from an environmental and economic perspective. Why was this work being done? The federal drilling permit, issued in June, notes that this was a bypass operation on an existing well (not a sidetrack as federal officials are saying). But it gives no explanation for why the bypass was required. Usually that’s an expensive, last resort fix for a serious technical problem with the well. Was the blowout preventer engaged? If not, why not? If so, why did it fail to do its job? Should the feds speed up the implementation of new BOP standards? Would these new standards have addressed the problem in this case? https://skytruth.org/wp-content/uploads/2013/07/Hercules-rig-fire-24july2013.jpg 349 620 John Amos /wp-content/uploads/2016/08/test_logo.png John Amos2013-07-24 13:57:002019-02-15 11:36:22Hercules Drill Rig Engulfed in Flames - Now What?